Last year I was lucky enough to attend a race/ride skills weekend organised under the auspices of Cycling NSW with coaches Donna Meehan & Jenny Triggs. Both women are accredited coaches but more importantly both are passionate about encouraging women to improve their cycling skills. They acknowledge that women learn in a different way to men and therefore the workshop is just for women. This year they are running a similar one day workshop on Saturday, 16 June at the cirterium track at Dunc Gray Velodrome in Bass Hill aimed at giving women the skills and confidence to be able to compete at club level races and beyond. I’ve signed up again because although the content may be similar to the last one, I’m sure there’s always more I can learn. You might be reading this and thinking that you’re not a racer but this day will give you some of the basic skills and will help you determine if racing is worth a try. When I started riding I had absolutely no interest in racing but the idea has grown on me and I’ve given it a go quite a few times. You really won’t know until you try. Who knows, you might love it. The day is open to all females 18 years and older (U19Lic) and will develop your road skills, bunch riding and race tactics so that you will be confident to enter club races. Road bikes are also available for hire the day and if you don’t currently hold an Australian Cycling Race License a day license will be available so you can participate in the racing. Participants will be able to put their skills to the test in a safe, car free race environment. There will be a few different styles of race on the day ranging from short criterium style to team events where riders will be seeded to their ability. For the afternoon of racing all riders will have an individual seeding worked from the two lap time trial before lunch. 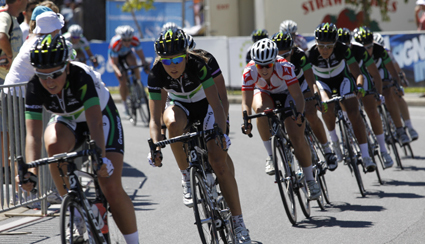 Races will include: time trials, mini criteriums, Italian pursuits with teams of five riders and team scratch races. The day will conclude at about 3.30 pm with a wrap-up and debrief.